Cook pasta as directed on package. Add spinach to the boiling water the last minute of cooking. Cook chicken and basil in large nonstick skillet sprayed with cooking spray on medium-high heat for around 3 minutes. Stir in spaghetti sauce, garlic, and tomatoes; bring to boil. Simmer on low heat for 3 minutes or until chicken is done. Stir in Neufchatel cheese and mix until combined. Drain pasta and spinach and return to pan. Stir in chicken mixture and 1/2 cup mozzarella and mix until combined. Spoon into a 2 quart baking dish. Bake 20 minutes in the oven. Top with remaining 1/2 cup mozzarella and Parmesan cheese. Bake for 2-3 minutes or until cheese is melted. 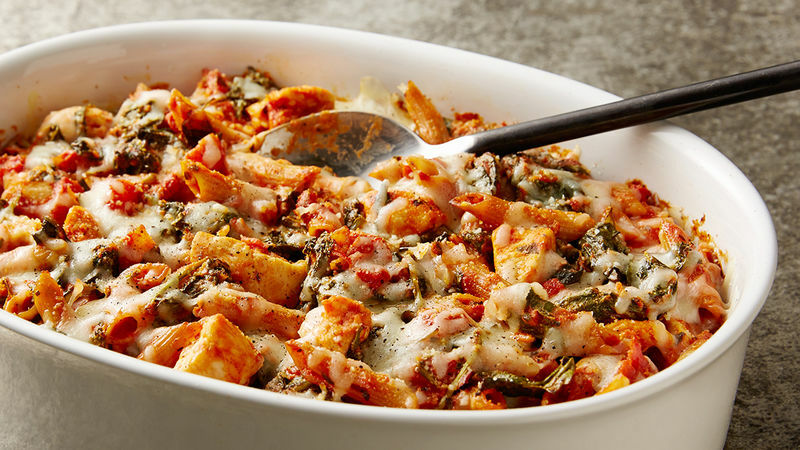 Three Cheeses + Chicken + Pasta = Wow Yah, this is THAT casserole. The one nearly everyone loves. You know you’re craving it. That down-home cheesy meal that makes people keep a keen eye on the casserole dish so they can return for more before it’s gone. This is that meal. Each of the three cheeses lends a different flavor angle, so together they make this pasta dish yummy. The secret to this recipe is that you don’t have to deprive yourself of the things you love. You can have pasta, but try to eat multi-grain or wheat pasta instead of the usual white. As for cheese…just don’t use too much. It’s all about moderation here. But you’ll see by experimenting with your own preferences that you can have a cheesy pasta dish without feeling totally weighted down by making a few select choices. This pasta bake is easy, cheesy and a great go-to for friends and family alike.